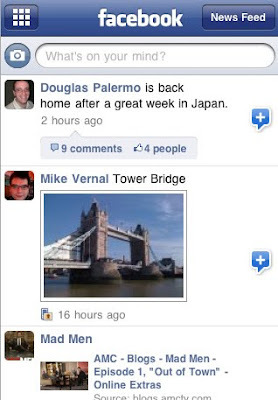 Facebook, the popular social networking site, has updated its Facebook app for the iPhone platform. Facebook 3.0 version has finally arrived at the Apple App Store and is available for download (iTunes Link) for free. With a good deal of improvements and interface changes, Facebook 3.0 app will certainly change the way iPhone or iPod Touch owners use the social network. The Facebook 3.0 update (1.3MB) has several modifications, like the main screen of Facebook looks like iPhone and has icons arranged in a grid. 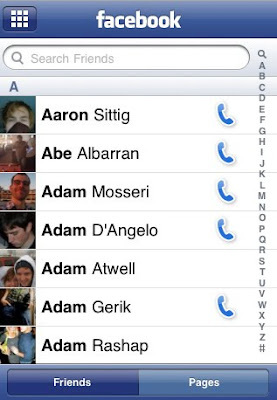 The grid is actually the home screen of the Facebook iPhone App, which can be organized. The update also has support for landscape mode. We took a quick look at the interface and here's our hand-on experience with the Facebook 3.0 App on the iPod Touch. Joe Hewitt, the official Facebook app for iPhone developer, noted on his twitter account that the most deserved feature - Push Notifications - will be available when Apple releases the iPhone OS 3.1 update. Note: App Store on iPhone or iPod Touch (when connected to WiFi) might not show update for Facebook app. The Facebook app can be manually searched for installation. 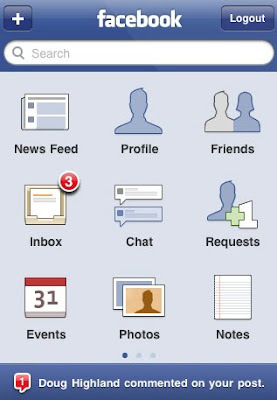 New Facebook home screen offers News Feed, Profile, Friends, Inbox, Chat, Requests, Events and Notes icons in a grid. If you press any icon and then release it, all the icons start wiggling just like the iPhone or iPod Touch icons wiggle for rearrangement. Press the Done button instead of HOME key of iPhone/iPod Touch to stop the icons from wiggling. On the home page, tap on the notification icon to see the notifications received. Tap on the grid button on the top left to see the Grid menu or Tap on the Facebook in the menu to return to the home screen (Grid menu). On swiping the screen from right to left, a blank page appears which allows adding shortcuts to favorite Friends and Pages. At the bottom of the Grid view is the notifications bar that will show new notifications, if any, in a red bubble. The News Feed looks almost the same like the previous version but it scrolls a bit faster. In the 3.0 version, the Facebook app also brings built-in browser that opens links posted in the users' timeline. However, the videos posted in the news feed aren't playable as of now. Hewitt acknowledged this issue and stated that Facebook will have to convert their videos to an iPhone playback friendly format. On the News Feed page, click on News Feed button on the top right. A scrollable pop-up shows up that allows choosing views for the listed items that appear on the left side of your home page on Facebook Web version. The inbox and photos would appear as they did in the last version of the app. The noteworthy part is that Inbox now allows deleting messages with the left to right finger swipe like the iPhone natively offers. However, it might take a while for the message to delete. This Delete option can also be used to remove the user posted wall posts or updates. Photos can be uploaded directly from the iPhone as the app allows creating new albums right from the iPhone or iPod Touch. Users can then Tag the photo, choose a photo from their album to make it their profile picture, delete it (from Facebook) and even choose 'Like'. Just like the native iPhone Photo interface, users can pinch-zoom on any photo uploaded on Facebook. Event section now shows up the events and birthdays of friends. This certainly is useful for folks with many contacts and friends to keep track of important event dates.